Posted: February 24, 2017 in Fotos, Who,What,Where & When...? The photos were taken in Cooper’s Surbiton workhop in early 1953, the cars are the CB Mk2 or T23. The essential difference (there were other improvements as well) between the T20/23 is that the latter used a spaceframe chassis, clear in shot, the earlier car a more traditional box section frame. Note the stack of frames, not yet stove-enamelled on the lower right of the shot. 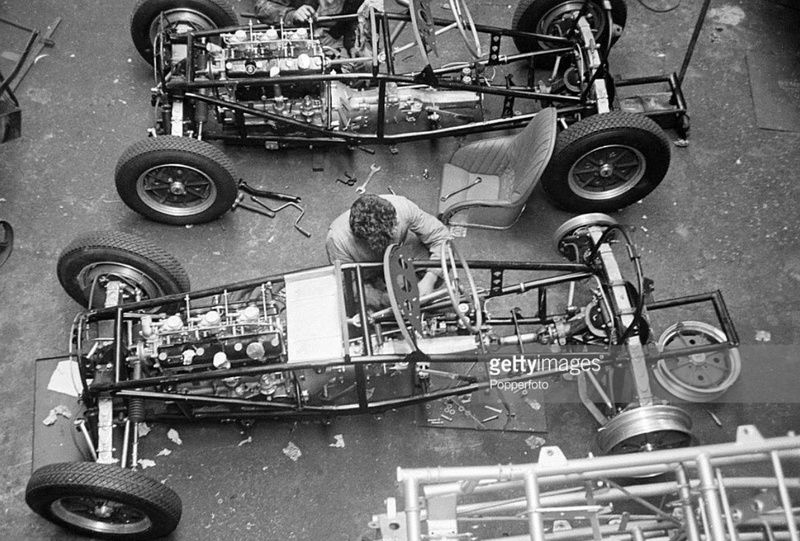 The workshop shots are great, the unclothed cars show the Bristol engine, the chassis and the suspension mix of wishbones and transverse leaf springs front and rear. Cooper were somewhat maligned over the years about their ‘curvy spaceframes’ by engineering purists but in comparison with other cars of this period, the Cooper is a paragon of modernity if not a perfect example of triangulation! 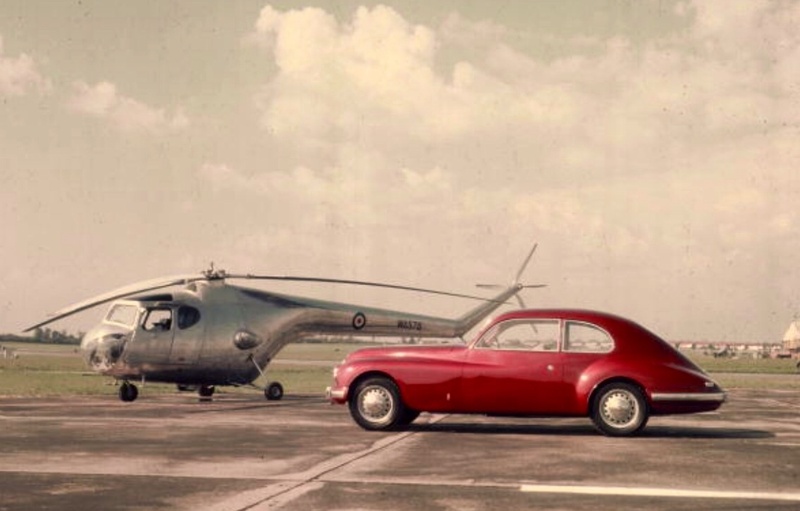 Doug Nye credits Dante Giacosa’s design of the 1946 Cisitalia D46 for Piero Dusio, as the first modern customer spaceframe car ‘the production racing car trendsetter for an entire generation of designers’. 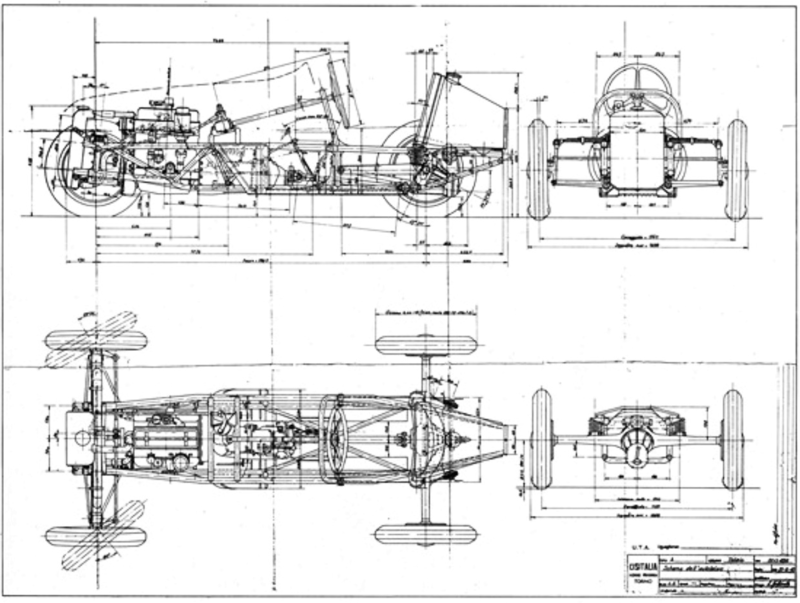 As stated above the Cooper Bristol Mk1 (T20) used a simple fabricated box-section single plane-ladder frame with tacked on body supports and was very successful. John Cooper and Owen Maddock’s (Cooper designer/engineer/draughtsman) 1953 Mk2/T23 used a multi-tubular frame which took advantage of the entire cross-sectional area available inside the body ‘and looked more like what would become known as a ‘spaceframe’ design though still sparsely triangulated…this new welded-up chassis frame employed all the same sized round section tube, and it was effectively the forerunner of many more British GP cars ‘spaceframes’ to follow’ Nye said. 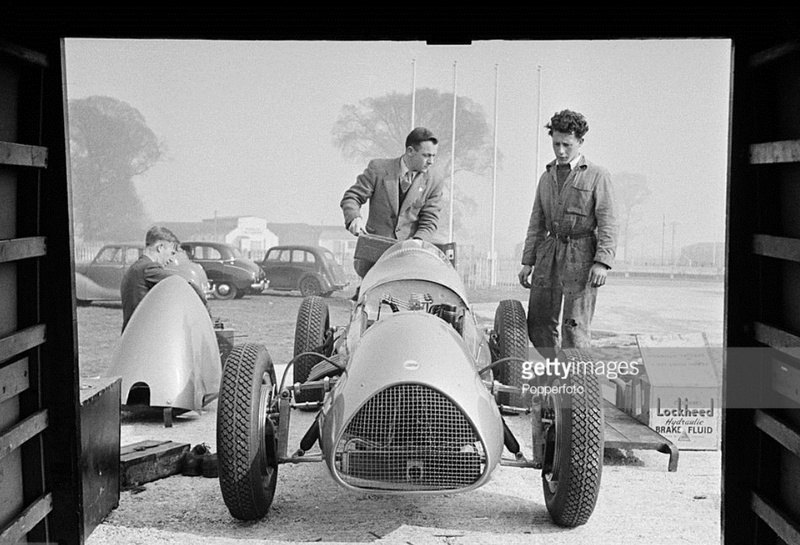 So, if the car isn’t the trendsetter Giacosa’s was the Cooper lads were certainly spaceframe ‘early adopters’, very successfully so. 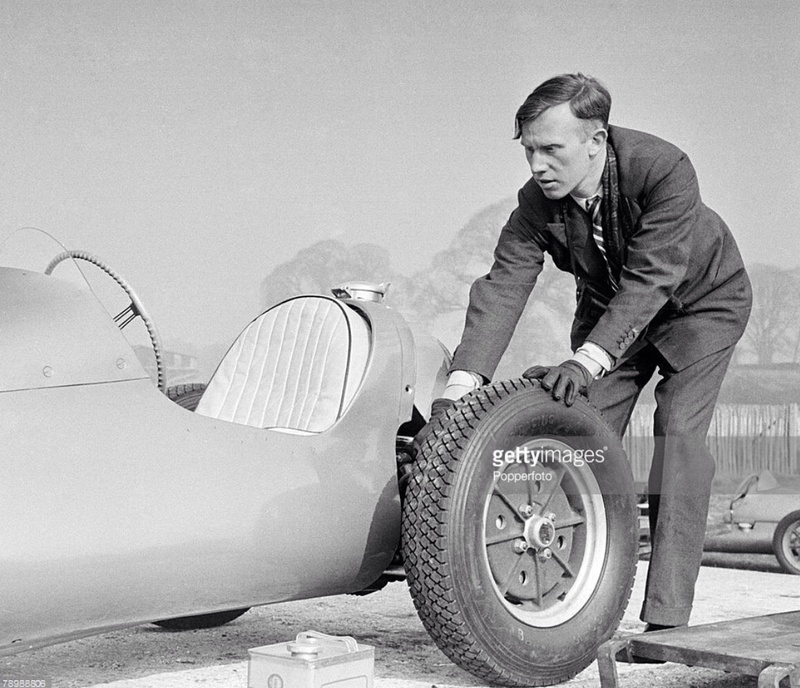 Note the beautiful light alloy Cooper wheels, rudimentary independent rear suspension set up of lower wishbones and top transverse leaf spring which would serve Cooper well till the end of the decade. Double wishbones and coil springs at the front appeared a bit earlier but the transverse top leaf is in use here. The Bristol/BMW engine develops around 155bhp from its 1971cc in BS4A spec, the engine is worth a paragraph or two. What follows is a summary in relation to the engines race application, not a chronology of the many variants fitted to road cars. One of its directors, HJ Aldington, had impeccable BMW connections, another of his companies, AFN Ltd were both the constructors of Frazer Nash cars and the pre-War importers of BMW. The 2 litre engine the subject of this article, was fitted to BMW’s superb 328 sports car, famously the winner of the 1940 Mille Miglia in Huschke von Hanstein’s hands.. In the post-war German mess, der Deutschlanders were keener for their technology to be shared with the ‘goodies rather than the baddies’ (the Ruskies), Aldington did a deal via the War Reparation Board which gave the engine technology to Bristol. The Brits fitted the engine to a 326 chassis and dressed the lot in an aerodynamic body similar to the 327 ‘Autenreith’ Coupe. The first Bristol built engine was fired up on their dyno on 22 May 1946 and was soon fitted to its prototype ‘400’ car. The engine was tall, slim and short despite its long stroke. The bores were cleverly siamesed within the cast iron block to allow the use of 4, rather than the 7 main bearings considered normal for a straight-six. The head had hemispherical combustion chambers with valves inclined at an included angle of 80 degrees with downdraught inlet ports between them. Rather than twin overhead camshafts the valves were operated by 18! inclined cross-pushrods. For its success it demanded great engineering precision in its build, something Bristol had in spades. A steel crank ran in Vandervell ‘ThinWall’ lead indium bearings. Dry cylinder liners were of Brivadium alloy-steel so hard that for racing Bristol didn’t consider them run in until the engine had done 8000 miles! After fitment of three downdraught SU carbs the ’85A’ engine developed 80bhp. The ’85C’ was fitted with three Solexes. In 1948/9 Aldington asked Bristol to develop a high performance variant for Frazer Nash, this ‘FNS’ (Frazer Nash Specification) unit with 0.15 larger inlet ports, improved crank counter weights, Delco-Remy distributor rather than the Lucas unit developed 126bhp @ 5500rpm. In the FN Le Mans Rep the engines were very successful. Encouraged by the Frazer Nash success, Bristol built a new ‘Bristol Sport’ (BS) engine based on the ‘403’ Type 100 spec engine. These had blocks cast in chrome alloy steel. With a 66mm bore and 96mm stroke they displaced 1971cc. The head was aluminium alloy with inlet valves made of chrome-nickel steel, exhaust valves of austentic-chrome steel. All of the valve gear was very light and polished. The crank was in aviation spec nitriding steel still running in 4 main bearings. A short duplex chain drove from the cranks nose to the high camshaft which ran in four bearings and carried a skew gear driving the distributor and oil pump shafts. High pressure lubrication was used but a wet sump retained. On ‘BS Series’ engines the head was ‘ported and polished’. These engines, the Mark 2 version used by Mike Hawthorn’s Lavant Cup winning Cooper T20 at the Goodwood Easter 1952 meeting developed 149.8bhp@5550rpm on the Filton dyno before Leslie Hawthorn deployed his secret ‘witches brew’ of nitro-methane to produce more power still. The ‘BS4A Mk1’ engines developed 155bhp@6000rpm and 148lb/ft of torque at 5000rpm. 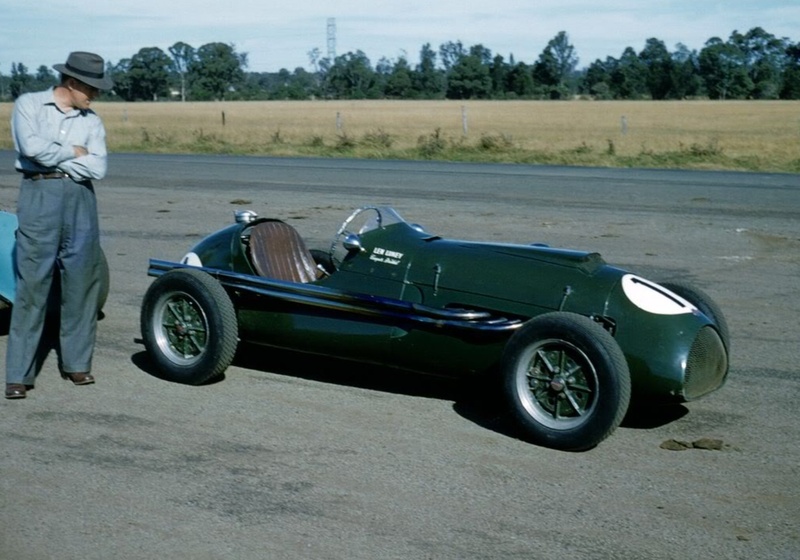 Ultimate versions of the German/British engines were Cooper Bristol driver/engineer Bob Gerard’s de-siamesed port 2.2 litre variants running nitro-methane which developed 180bhp@7000rpm. Bristol’s own de-siamesed engine which ran at Le Mans in its Coupes developed a reliable 160bhp. 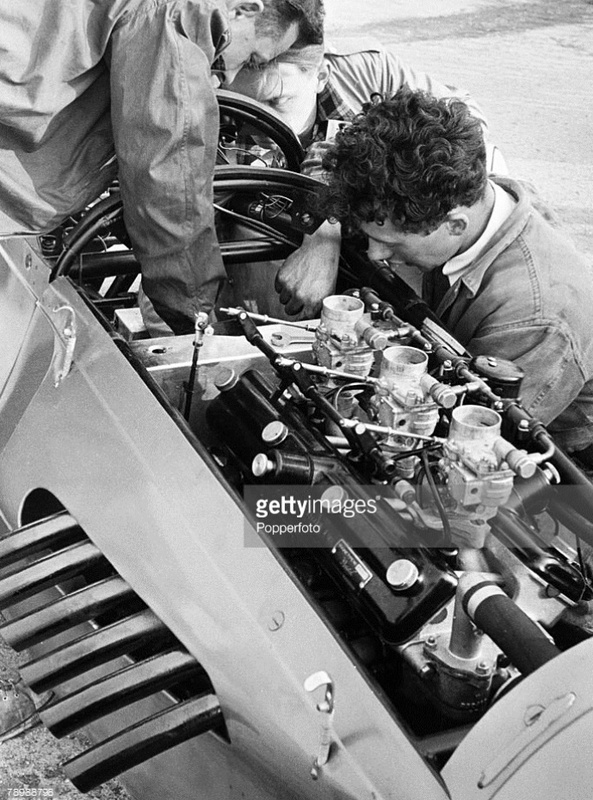 By that time the 2 litre F2 racing for which these engines were developed was over. Mark, I don’t recall ever seeing those Goodwood C-B photos before, but have seen the factory photos. So not sure of the date and I don’t have enough of the 1952 Autosport mags to see if they appear in an issue around then. For England though, it can’t be too late in the year because the lads aren’t dressed in big coats and it’s not raining! The C-B MkII was shown for the first time at the 1952 Earls Court Motor Show, as part of the racing car displays (Connaught, Kieft, Alta, Frazer-Nash, HWM, etc) on stands 127 & 128. As far as I’m aware this took place October 22 to November 1. HRH Princess Margaret visited Cooper’s stand at Earls Court and spoke to Charles Cooper. I’m not a facebook user, but I’m aware that if you check here https://www.facebook.com/coopercarcompany/ and scroll to Jan 21 you’ll find a couple of relevant Earls Court MS C-B photos One is shown by Chris Dawson, ex employee of John Cooper Garages at Ferring. 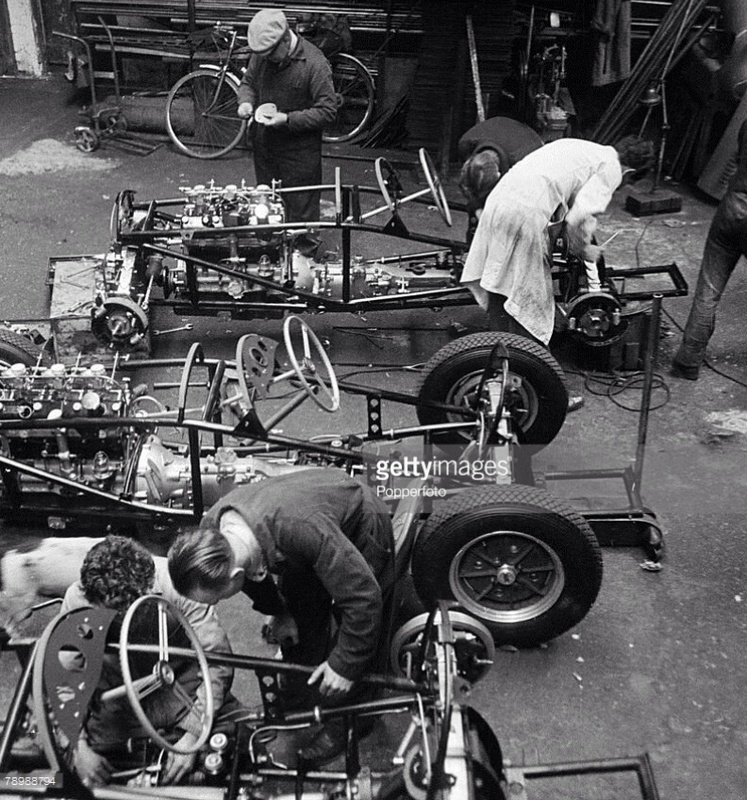 They are amazingly clear chassis shots aren’t they, apart from the early ’50’s ‘almospherics’ as to workplace. It looks as tho the first batch of T23’s, was around 5 cars- 3 on the floor being built and a couple of chassis stacked up, total build of around 10 Mk2’s? So two batches maybe? Have you any guesses as to the test pilot? I’ll have a search of the Earls Court Show to see what i can dig up. 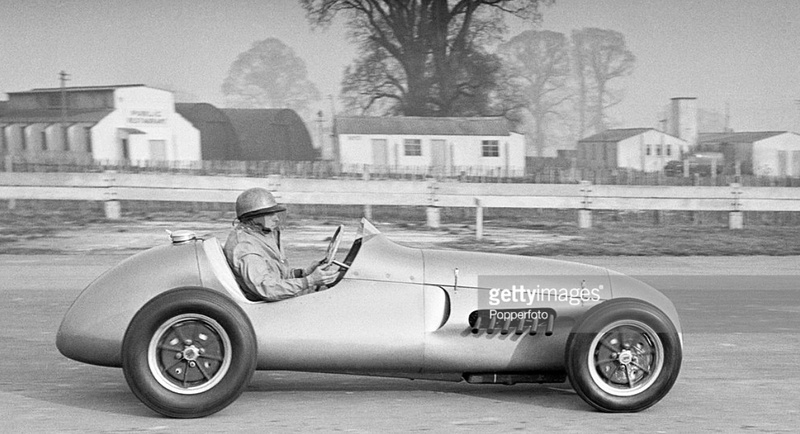 There are quite a lot of Getty shots from outside the horsepower press so I rather suspect however tight Charlie Cooper held the purse strings that there was a PR/professional photography budget! Let’s be thankful for theses shots which tell a whole lot more than just another circuit image. What PR budget there was would have been spent on the brochures Cooper had produced or reprinted from the weekly mags – Autosport, The Autocar, The Motor, etc. Regular visits from the weekly mag’s photographer meant plenty of photos were taken over the years. Can’t quite pickup enough in the side view photo, whether it’s JNC or not, having a steer. I think there was around 15 or 16 MkII built, and high chance the Ellacott colour photo shown above is the last chassis built.